Amish Baby Cribs | Amish Originals Furniture Co.
Start your child’s life off right with 100% American hardwood Amish baby cribs from Amish Originals Furniture Co. Converting from crib to toddler bed to full sized bed, our Amish baby cribs in Columbus, Ohio will grow along with your child. The Amish are a plain people who focus on the simple things in life. Form and function are the rules for their woodworking. 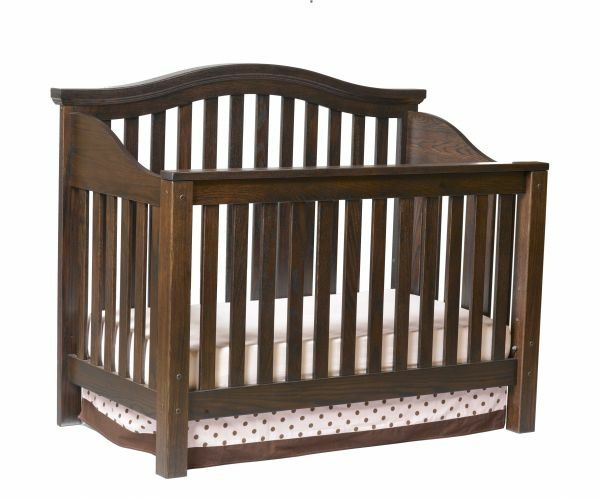 Our Amish baby cribs are made not only to be functional and last throughout all stages of your child’s development, but they are also built to be beautiful, taking advantage of the natural look and style of American hardwoods. Working with over 70 local Amish craftsmen, Amish Originals strives to bring you the finest Amish baby cribs in the Columbus area. Our Amish craftsmen will build your Amish baby crib to order so you can get the look and feel you want. Wanting a custom style? The friendly staff at our Westerville, Ohio showroom can walk you through the process allowing you to focus less on prep and more on welcoming your bundle of joy. Begin a family tradition today with Amish baby cribs from Amish Originals. Take a look and see what styles of Amish baby cribs we offer in our online catalog. Then, come visit our Westerville showroom and see the styles in person. Just have a question about Amish baby cribs? Contact us today and we’ll get back with the information you’re looking for.